each fuel stop required removal of the tank bag. because I electrified Otus’ tank bag I have to do a bit of unplugging to get the tank bag out of the way when refueling. 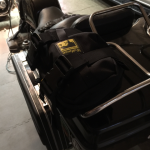 a tank bag on the oilhead – at least the one I settled on – looked kinda stupid on the bike. the bag on Otus didn’t look right on Strix either. Because I couldn’t get happy with the tank bag situation on Otus and couldn’t find one I liked on Strix, I decided it was time to abandon the use of a tank bag entirely. In spite of this I didn’t want to have to be constantly getting into the top case so I decided to look for a slightly different solution – a bag to put on the top case rack. 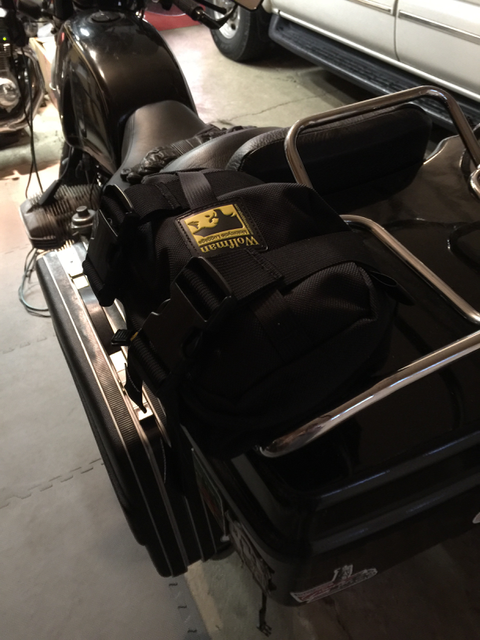 The first experiment was to try the tank bag on the top case luggage rack. After all, it was certainly big enough to carry all the stuff I typically carry but because I had changed the approach to powering the phone and GPS I didn’t need the electrified tank on the back either. 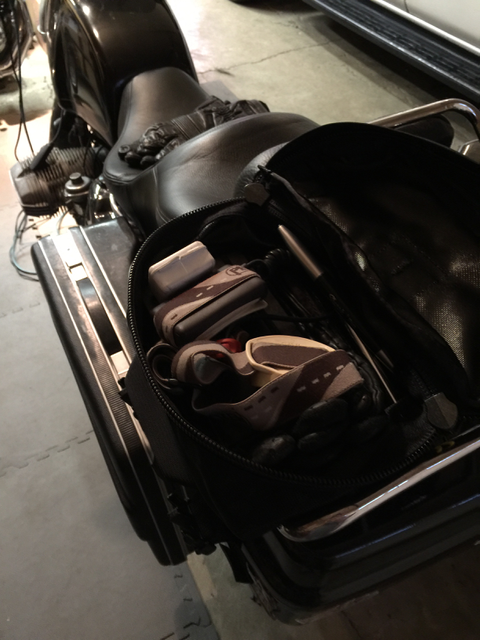 So I set the tank bag on the shelf and turned my attention to the Googles for an all-out search for the perfect bag. 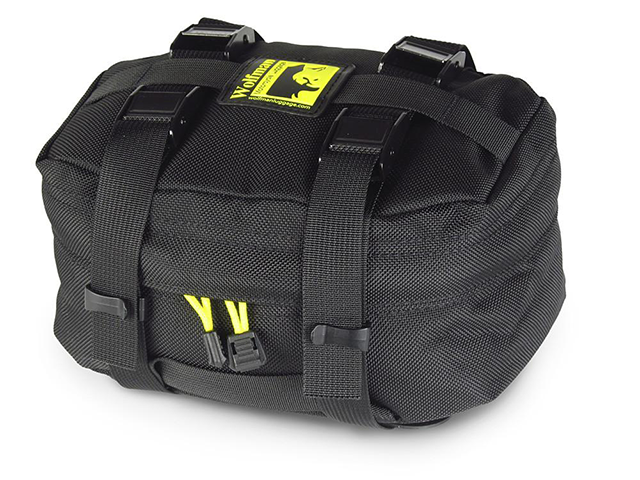 So, Jill bought me two of these bags for Christmas – one for each bike. After wandering the hardware store today I figured out how to attach the base to the top case luggage rack without drilling any (more) holes in the case – the venerable P Clamp. Take a second to measure the diameter of your luggage rack rails so the clamp will clamp down tightly but these worked perfectly to attach the base to the luggage rack. Attach the bag, snap the buckles, and I’m ready to go. 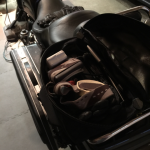 And I no longer have to remove my tank bag to refuel my bike! I have another kit to install on Strix. That’ll happen this evening. I could have used smaller p-clamps on Otus’ luggage rack. This would have allowed the base to lay completely flat on the luggage rack but it wasn’t worth making another trip to the hardware store for another set of clamps. I’ll grab more next time I’m up there. Apparently my dial calipers aren’t all that accurate so those will be getting replaced too. If I wanted to make a bit more room on the luggage rack I could flip the clamps 180 degrees and move the bag out even further. The only other item I carry on the luggage rack is the motorcycle cover but there’s plenty of room for it with the bag where it is. Jill mentioned how very nice the folks at Wolfman were when she called to make a correction to the online order. Good customer service is so uncommon these days I wanted to make sure and mention how good they were to Jill! I only have one more issue to resolve to absolutely eliminate the need for a tank bag permanently. More to come on that issue after today’s mail delivery.